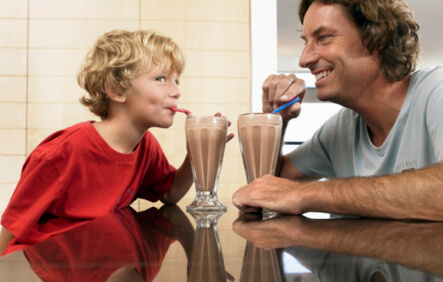 Parents are often reluctant to let their children drink too much chocolate (or otherwise flavored) milk, concerned that this will give their kids too much sugar or fat. Actually, a glass of flavored milk contains less sugar than many juices, fruit drinks, or sodas. Furthermore, a University of Vermont study published in the June 2002 issue of the Journal of the American Dietetic Association culled very interesting information from the from USDA’s large Continuing Survey of Food Intakes of Individuals (CSFII). Children who drink flavored milk are more likely to meet the calcium requirements than their peers, and no more likely to have greater sugar or fat intake. Children age 1-3 need 500 mg of calcium per day, age 4-8 need 800 mg, and over 9 need 1300 mg. A glass of milk contains about 300 mg. A serving of yogurt contains about 400 mg. Previous data from the same researcher found that only those children who consumed milk or calcium-rich foods at lunchtime tended to get the calcium they needed each day.